By 11 p.m. Monday, Michael’s top sustained winds were around 90 mph (144 kph) as it headed north at 12 mph (19 kph). By 8 p.m. Monday, Michael’s top sustained winds were around 85 mph (140 kph) as it headed north at 12 mph (19 kph). Forecasters at the Miami center say Michael is expected to strengthen quickly and become a major hurricane by Tuesday night. Landfall is expected Wednesday on Florida’s northeast Gulf Coast. Escambia County Sheriff David Morgan warned residents during a news conference Monday evening that first responders won’t be able to reach them during the storm or immediately after. Florida Gov. Rick Scott said during a news conference Monday that the Florida Agency for Health Care Administration has reached out to hospitals, nursing homes and other facilities to make sure they’re prepared. In the days following Hurricane Irma last year, 14 people died after a South Florida nursing home lost power and air conditioning. Tallahassee Mayor Andrew Gillum says the rapid rise of Hurricane Michael led city officials to hold a “sobering” discussion about the potential impact the storm will have on the area. He noted that residents in the nearby coastal county of Wakulla were being forced to keep their shelters shut because they aren’t built to withstand severe winds that may come with Hurricane Michael. 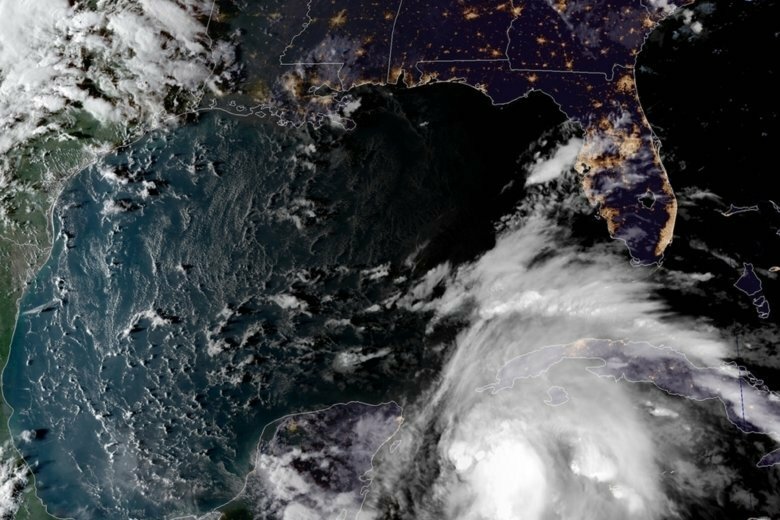 The hurricane, currently off Cuba’s western tip, is expected to make landfall on the Florida panhandle and affect portions of southern Alabama. Some southern Alabama counties were under a tropical storm watch Monday afternoon. High surf warnings were in effect already at the Alabama coast. The governor’s office cautioned that flash flooding and tornadoes are possible with any hurricane. Hurricane Michael is gaining strength as it lashes Cuba’s western tip and lumbers northward toward the U.S. The National Hurricane center says the storm is expected to become a major hurricane by Tuesday night. In a Monday afternoon update, forecasters said winds have increased to nearly 80 mph (129 kph) as the storm moves north at nearly 9 mph (14 kph). Hurricane-force winds extend outward up to 35 miles (56 kilometers) from the storm’s center and tropical-storm-force winds extend outward up to 175 miles (282 kilometers). The storm was located about 30 miles (48 kilometers) northwest of Cuba’s western tip and 520 miles (837 kilometers) south of Apalachicola, Florida. Hurricane-force winds and strong rain were being felt in Cuba. A storm surge warning was issued for Florida’s Gulf coast from the Okaloosa-Walton County Line to Anclote River. Florida Gov. Rick Scott says Hurricane Michael is a “monstrous storm” that has the potential to be devastating to the Florida Panhandle. Speaking alongside emergency officials in Pasco County, Scott said Monday he’s waiving tolls. He also has declared a state of emergency for 35 counties and asked President Donald Trump for assistance ahead of the storm. Three Florida Panhandle counties have issued mandatory evacuation orders ahead of Hurricane Michael’s expected landfall. In a Facebook post Monday, the Wakulla County Sheriff’s Office said no shelters would be open in Wakulla County because Michael was forecast to become a major hurricane with winds topping 111 mph (178 kph). The National Hurricane Center in Miami says Michael’s top sustained winds were around 75 mph (120 kph). The storm was moving north around 7 mph (11 kph). Forecasters say Michael will move into very warm waters in the Gulf of Mexico. It could strengthen into a major hurricane with winds topping 111 mph (178 kph) before an expected strike Wednesday on Florida’s Panhandle. According to the hurricane center, Michael’s top sustained winds were around 75 mph (120 kph). The storm was moving north around 7 mph (11 kph). Michael is forecast to make landfall by midweek in Florida’s Panhandle or Big Bend. The director of the National Hurricane Center says Florida’s Big Bend could see up to 11 feet (3.35 meters) of storm surge after Tropical Storm Michael strengthens into a hurricane over the warm waters of the Gulf of Mexico. Ken Graham says the storm’s large size, strong winds and heavy rains could produce a lot of flooding, and the shape of this stretch of coastline makes it particularly vulnerable to storm surge.